As taste sensations go, there is little to beat a hunk of well seasoned Argentinian beef, chargrilled and accompanied by a glass of decent Malbec. Chewing on the salty, aged and bloody meat causes a tingling in your gums as if a bovine mouthwash. This then undergoes some kind of chemical reaction with the deep, moody, spicy wine that leaves you digesting the meal for a whole week. Sharp pangs – taste reminders – keep haunting you like salivating ghosts of taste past that make you press your teeth together in muscle memory. As Argentinian steakhouses go, The Gaucho Grill takes the biscuit. Not only for great steaks with superb ghost potential, but also for awesome (by which I mean sky high) wine prices. Markups of over 300% are commonplace. That is four times the retail price and presumably they pay the importer much less! Is there a venue which matches the steak quality and authenticity, but where the only fleecing is associated with an occasional lamb chop? In Leeds, a place I dine all too rarely these days, River Plate has appeared on the site once known as the Calls Grill. The menu looked pretty similar to Gaucho but, to be frank, the wine list looked cheap! However, it is limited in scale, only 6 Argie wines could I find, which is a pretty poor show. Fortunately amongst that half dozen I found a real gem after a Club class style upgrade. I ordered an interesting looking Malbec that was sure to go with my steak. 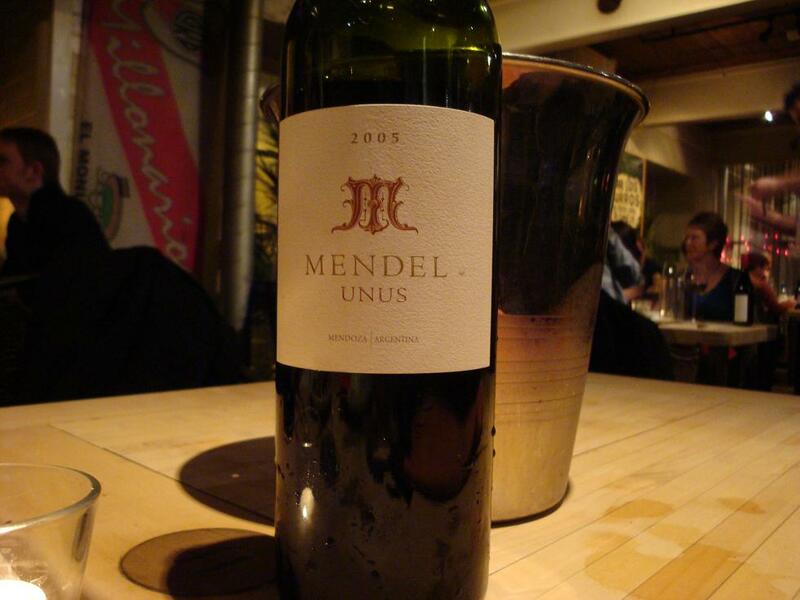 The Mendel 2006 was out of stock though, so at the same price (£33.95) I was served a Mendel Unus 2005 – a wonderful blend of 65% Malbec and 35% Cabernet Sauvignon, normal price £37.95. It tastes of Autumn fruit crumble, vanilla and ginger cream and cayenne pepper. It is worth coming to this place if only to try this gorgeous wine and needless to say it goes perfectly with a matured and seasoned beef slab. Adamo, the manager, insists that Unus is not available retail in the UK but I was delighted to find it at the ever dependable Wine Society at £20 per bottle. This makes the River Plate markup extremely reasonable at a mere 90%. As for the food, the baked Provolone cheese was no more, replaced by Brie. The trick with this dish is to warm the cheese through without turning it into a puddle, which River Plate achieved perfectly. The herbed toast added value in three highly tasty but barely 50 pence sized pieces. From the steak menu I selected (without assistance or the pomp and ceremony of examining a parade of different cuts on a chopping board) a ribeye 300g. I asked the waitress how it should be cooked expecting a recommendation. A marbled steak like ribeye is mostly suggested to be served medium to allow the fat to melt into the tender flesh. I don’t think my question was understood as I was asked if I liked my meat pink or red. I like it bloody but not fatty so I ordered it medium rare. The steak was certainly well seasoned. So much so that any more than 300g and I think it would have difficult to continue eating. But such an intense taste sensation is enormously pleasurable in small portions. If you are hungry never fear because the vegetables came in cow sized portions. The only slight disappointment was the soggy chips. 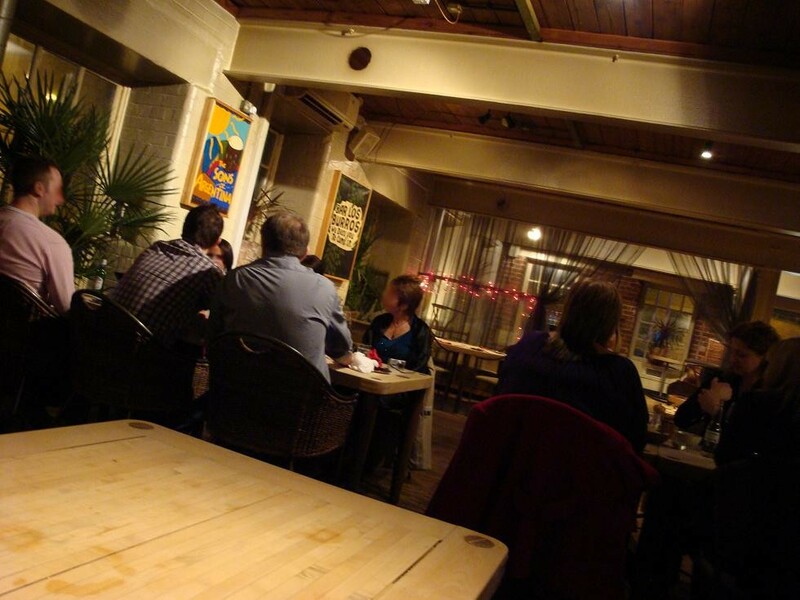 The ambience somehow feels more authentic than the Gaucho – a little bit more rustic and relaxed, but never having been to Argentina I am not qualified to say. I just prefer to eat in a slightly more informal atmosphere. The bill at £102.40 for two was good value for a couple of glasses of champagne, a bottle of tip top wine, and 3 food courses. If Buenos Aires is a carbon stomp too far for you, I thoroughly recommend a visit to the the Pampas of Leeds. Only 1 hour by road or rail from The Gaucho Grill, Manchester. 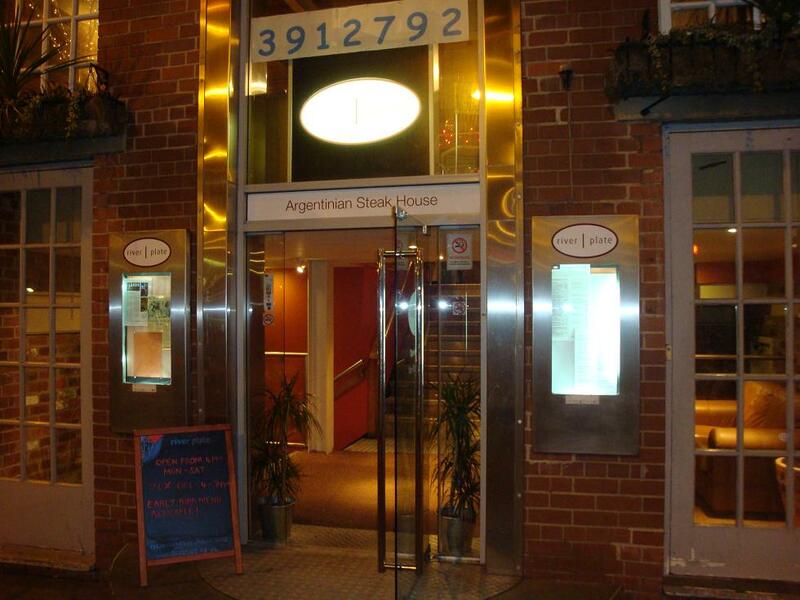 River Plate Argentinian Steakhouse, 36-38 The Calls, Leeds. LS2 7EW. This entry was posted on Sunday, March 8th, 2009 at 4:14 pm	and is filed under food, south america. You can follow any responses to this entry through the RSS 2.0 feed. You can leave a response, or trackback from your own site. We were there last weekend and came away having spent a little less than you (there was no way we could have fitted in a pudding and we ordered a significantly cheaper wine). I had the bife de chorizo which was gorgeous and our chips weren’t soggy (but there were a lot of them!). What beats it hands down is grilled over a real charcoal fire, as per the Gauchos in Amsterdam which have the grill in the restaurant itself and frequently in the window so you can see it from the street. Gaucho UK”s wine markups are obscene. But Malbec and grilled beef is a combination made in heaven!